For residents in Chandigarh who feel overwhelmed by rapid motorization of their city, here’s some news to cheer. 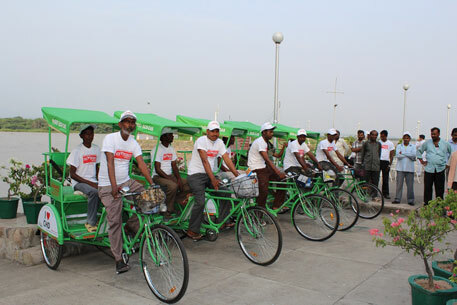 On June 25, the city authorities inaugurated an eco-cab service at Sukhna lake, a tourist attraction in Chandigarh. To begin with, five eco-cabs, which are specially designed cycle rickshaws, will ply between Sukhna lake and the famous rock garden that attracts visitors from all over India. Passengers will be charged Rs 20 per trip. The service has been introduced by Fazilka Ecocabs—the world’s first dial-a-rickshaw service started in Fazilka in Punjab in 2008. After the success in Fazilka, the Punjab and Haryana High Court on its own initiative in 2010 directed both Punjab and Haryana to introduce eco-cabs in their cities and the Union Territory of Chandigarh. Graduates Welfare Association Fazilka, an NGO, started the Fazilka experiment; it has launched the service in Chandigarh along with a few volunteers from Chandigarh and support of the municipal corporation and Chandigarh administration. Navdeep Asija, founder of ecocabs, says as Chandigarh becomes more pedestrian unfriendly, people use their cars even to cover short distances. “As the city is expands, it's getting difficult to find a rickshaw. Not only the roads are becoming increasingly unfriendly to non-motorised transport, people also seek quick movement. Even for short distance travel, residents prefer to use private vehicles. This need can be easily met by rickshaws as they are a recommended mode up to three kilometre range,” he says. He elaborates on the merits of promoting this zero-polluting mode of transport. There are around 25,000 rickshaws plying in Chandigarh, transporting 20 passengers each and, hence, saving 75,000 litres of fuel daily. It has been estimated that the proposed Chandigarh metro rail network will cater to 318,000 people per day in 2018. Rickshaws are already ferrying 500,000 passengers daily. This demand can easily be increased by 5-10 per cent through good cycle stands and passenger information, he adds. There are two components to Chandigarh's ecocab project: a) introduce dial a rickshaw service and improve and increase accessibility; b) rapid rickshaw transit—improve the frequency by adding new rickshaws. These two parts of the project will be implemented in three phases. First, is the introduction of rickshaw service at Sukhna Lake, covering the lake area and Rock garden; second, introducing the rickshaws on Geri route, (a network of streets covering sectors 8 to 11)—these would also be known as tourist rickshaws and cover all the tourist spots in Chandigarh; and third phase would be introduced in sector 17. The project is a one of its kind initiative in the city where a group of volunteers have collaborated to provide a facility that enables the residents to call up rickshaw operators on their cellphones. The phone numbers of rickshaw operators (sector-wise), for dial-a-rickshaw service are available on the website www.chandigarh.ecocabs.org, and keeping in mind the comfort of the residents they have provided an advanced call system; now the service is also available on android-based smart phones as an App called Chandigarh Eco-cabs. V K Singh, Finance secretary, Chandigarh Administration says it’s a good initiative and good technology introduced to improve this para transit service which has always been neglected. “This will create uniqueness to the designed city of Chandigarh and will help reduce the increasing use of personal vehicles in the neighbourhood areas,” he adds. The volunteers of Chandigarh Eco-cabs has already prepared data on the web portal of the phone numbers of all the rickshaw pullers in the city who have cell phones. This is done by designating one mentor in each sector, whosoever sends more entries of registering the rickshaw pullers, becomes a mentor. At present, there are around 170 cycle stands in the city from sector 1-47; therefore, sector-wise cycle stands and phone numbers of rickshaw pullers available there is mentioned in the data. The residents will be able to contact their nearest cab owners directly on their cell phones. The website has a database of 200 rickshaw operators who are spread across 12 sectors. The service is available in Sectors 5, 9, 11, 15, 16, 17, 40, 41, 43, 44, 45, 46 and 47. Pallav Mukherjee, an architect in Chandigarh says, "Chandigarh consumes more than a million litres petrol, and on an average one petrol pump is selling 400,000 litres of petrol per day. We have more than 7,000 cities in India and as the demand increases we cannot afford to import that kind of fuel in the coming years. A sustainable solution is needed,” he says. There is a special Purpose vehicle constituted for the successful implementation of Chandigarh eco-cabs project and the New Kranti Cycle Rickshaw Worker Union (NCKRWU) is a key stakeholder. “NCKRWU is the biggest association of Chandigarh cycle rickshaw operators, working with more than 17,000 rickshaw operators. Imagining this project without NKCRWU’s enthusiastic support could not have been possible” says Asija. As part of the future plan, the service will create one central number for each sector, so that a person can just dial the number and add his or her sector number in the end and get the service at the doorstep. Way to go, Chandigarh! Lead the way! Thanks for information,I think other website proprietors should take this web site as an model, very clean and wonderful user genial style and design, as well as the content. You are an expert in this topic! I really appreciate such type of eco-friendly activity...you may say this is an need of today's generation...high ratio of vehicle ultimately affecting our environment...Thanks for sharing wonderful article.